The increasing availability of environmental data sets provides an opportunity to engage students in STEM and improve quantitative reasoning through open-ended exploration and interpretation of real-world data. The wealth of publicly available data online provides an opportunity to engage students in scientific inquiry while simultaneously improving quantitative reasoning. Open-ended exploration through the analysis and interpretation of large data sets can have substantial benefits as students explore the stochastic nature of environmental and Earth systems. Employers are increasingly looking for graduates who have the ability to do quantitative reasoning and skills to work with data. At the same time, there are structural, pedagogical and time limitations to teaching the quantitative skills undergraduate students need to successfully work with data. This workshop will bring together people who teach in environmental fields (geology, Earth science, hydrology, limnology, environmental science, oceanography, ecology etc.) 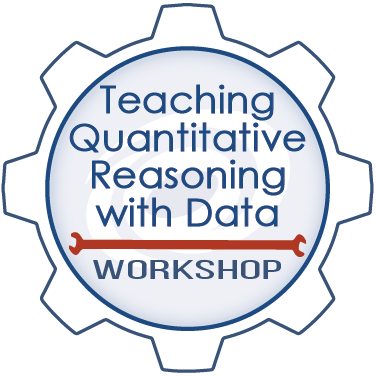 at a variety of institution types to share materials and approaches and to build a community interested in understanding current best practices and strategies, as well as the continuing needs and barriers associated with teaching quantitative reasoning and teaching with large data sets. Time will be allocated for individual action planning and opportunity for peer input. Project EDDIE is a 5 year effort to build curricular material and professional development support for people to teach quantitative reasoning skills in undergraduate courses. Participants will help create a community vision and identify the topics, skills, and people to inform the design and development of teaching modules at a second EDDIE workshop scheduled for Fall 2019. We encourage the reuse and dissemination of the material on this site for noncommercial purposes as long as attribution to the original material on the EDDIE site is retained.